thanks to Laura Rose, who has been encouraging me to pursue bobbin lace. Thank you Laura! If you haven't visited Laura's site, you should! She has a very special piece of Beds lace the size of a CD... it's awesome! Today after school, I put a fabric cover on my bobbin lace pillow and practiced the first lesson in my book Bobbin Lace by Gilian Dye & Adrienne Thunder. I learned how to wind bobbins and work a plait. It went fairly quickly and for a first time effort, I was pleased with how my plait turned out. I'm sure I'll look at this picture in a few months and wonder how I could ever have been pleased with this effort, but for now I'm happy. I really don't like the pillow, though. I have a feeling I might have to buy a decent one soon! Any suggestions from experienced lace makers are welcome! I couldn't help myself! Myra's patterns are like popcorn... I just can't stop! This is No. 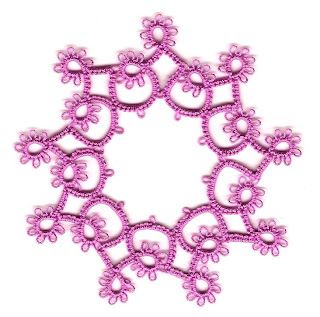 2 Another "Hanky Edge" Snowflake from Tatting by Myra Piper. Can you tell what thread this is? Yup... Lizbeth Spring Green! I took my Lacis bobbin lace kit out today and put all the pins in my little hedgehog pin cushion that I bought at the Lafayette Lacers Lace Days two years ago... I knew I'd find the perfect use for it! I read through the instruction sheet, but didn't get any further than reading. I have to choose fabric to cover the board, and I have too much fabric to choose from! I also spent time going through my new book, Bobbin Lace by Gilian Dye and Adrienne Thunder. It's a very inspirational book! I almost forgot! This makes #17 for the 25 Motif Challenge! I really wanted to justify my lace day purchases, so I set to work with my new book Tatting by Myra Piper. 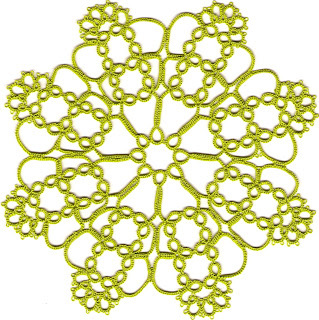 This is the first design in the book, described by Myra as "...my first tatted snowflake pattern, a revised edging which I made for handkerchiefs." This was a fun one to tat in Lizbeth Raspberry Pink Lt. #623. There are 47 designs in this book, and I think I might have to tat every single one... if they're all as easy to understand! If you've been thinking of trying Lizbeth thread, I highly recommend it. The colors are gorgeous, and it's very smooth. This is #16 for the 25 Motif Challenge. I really am going to try bobbin lace on my own, so I needed a little inspiration... a book that I've been reading about for a few weeks, plus one on making bobbin lace fans! I had to have the fan book... I bought the fan sticks in birdseye maple! I also had to have some beautiful bobbins. There's nothing more inspirational than beautiful tools! You'd think I didn't have any thread at home... wrong! I just couldn't resist buying more Lizbeth... the 15 colors I had just weren't enough! It doesn't hurt to have a little extra Olympus, Majestic, or Presencia lying around the house either! I was thrilled to find some Oliver Twist. I've been reading about it on other people's blogs, and it is beautiful thread! I believe I already have the Romanian Point Lace book, but this one is a different edition than the one I have. Besides, I'm not real sure where my copy is hiding! 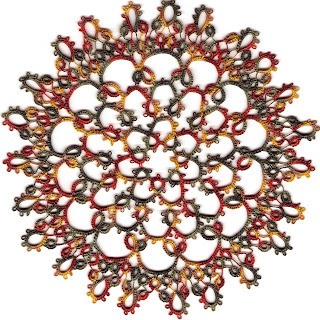 The tatting book is one I'd been thinking of buying, and when I found out it was out of print... sold! Did I really need any more shuttles? No! But, I always like to have some Sew-Mates and Clovers on hand. 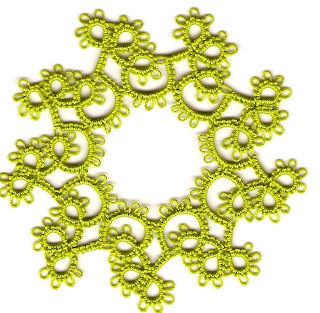 You never know when an opportunity might arise for teaching tatting to a newbie! I have a good excuse for playing today... it's snowing! I'll be sure to post pictures of what I make with my new treasures! Yesterday, my sister-in-law and I drove down for the Lafayette Lacers Lace Day... what fun! We arrived around 10:45 and chatted with vendors and other shoppers for almost two hours before taking a lunch break. Karen is looking for a hobby for when she retires, and came along to learn. She and I were fascinated by all the beautiful books, materials, and tools available. Of course I made sure I purchased something from each vendor! I loved the bobbin lace class! I didn't have time to finish my project, but I now understand the process. I'm very much a visual learner, and while I love reading books, many times techniques make no sense to me until I see them. Now I feel confident enough to open up that beginning bobbin lace kit that I bought from Lacis years ago! A big bonus for me was that I got to see The Tatting Goddess and The Battatter again! I met them both at the lace days two years ago, and they both have such lovely, welcoming smiles that I felt that I was a member of Lafayette Lacers for a day! I can hardly wait for the next lace days! I'll add pics of my purchases later in the day when I have some light. Sorry, no pics of the Lace Days. I took my camera with me, and never thought to take it out of my purse! at least not for me! 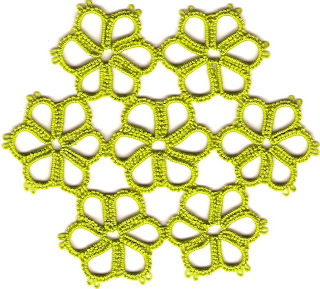 One of my goals has been to try patterns from each of my tatting books... not an easy goal! I have way too many books, not that I'm complaining! Plus, I tend to go in streaks as to what I like... remember all those Spinning Wheels? One of the books I love is The Tatted Artistry of Teiko Fujito. I am impressed by the delicate designs, and I wrongfully assumed that I would be able to tat something easily! The book starts out with some beautiful one-shuttle patterns. I tried the first one and just couldn't get the picot length correct. I'll have to save that pattern for another day when all the pistons in my brain are firing correctly! This little coaster is the second design in the book, and boy howdy! Did I ever have trouble with this one! First, some rings closed smoothly and caused me no problems. Others seemed to bunch up as I tried to close them. I soon realized that I was holding the rings differently when they closed smoothly. My third problem was that somehow my rings just didn't seem to be the same size, even though the stitch count was always correct. I can only assume that sometimes my tatting was tighter than others. You'd think I'd be done complaining, but I'm not! When I got to the last ring, I had a terrible time trying to figure out how to join to the first motif. The end result... a twisted join. Oh, well! I like it anyway, and if I don't have my glasses on, I can't see the stuff that would bother me upon close inspection! I think I'll rest my brain now and work on an Iris Niebach doily! I think I'd better choose another pattern to tat quickly! P.S. - This makes #15 for the 25 Motif Challenge! Have I told you that Beatrice is one of my favorite Iris Niebach patterns? I don't know how many of these I've made, but I never get tired of Beatrice. This one is in Lizbeth Spring Green from Handy Hands. There is one mistake where I forgot to join, but as my friend Shirlee would say... it's good enough for who it's for... me! Oklahoma! was fabulous! I'm always amazed at the talent that can be found among high school students. I'm also amazed at the talent my daughter has for getting almost 30 students to work together in a production this size! This scene is the yard outside Aunt Eller's house before the party. My daughter Carol designed the set and did most of the painting. My husband Dave helped build the house. This scene is during "The Farmer and the Cowman Should Be Friends." Carol designed and painted this set as well. I'm so proud of her and all the kids! Dave and I attended all three performances, and they were all fantastic! Now I have to catch up on all the laundry that didn't get done this weekend! 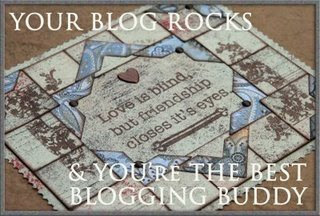 I've been honored, along with several others, with the title of Blog Queen by our very own Sherry Pence... LadyShuttleMaker! Thank you for the honor Sherry! SEASONED: She has blogged for at least one year. PROLIFIC: She writes several posts each month. FUNNY: She make us smile with her witty humor. ADDICTIVE: She keeps us coming back for more. You may accept this award or not. There are no rules to follow. You may pass it on as you please. This is just to let you know that you make my day! Steady Internet access at last! For four weeks now, I've had spotty Internet access. I've been so busy, that I didn't make a service call until Saturday. I'd only think of calling early in the morning or late at night when the office was closed. Foolish me! The repair guy came out yesterday, repositioned the dish and clamped it down tightly in less than 10 minutes! I'm busy working on Beatrice in Lizbeth Spring Green... it's so pretty! I'd post a picture, but it's too dark out to take a good picture, and I need to do some computer work so that I can scan to my laptop... my desktop computer is just too old and slow... and honestly, I'd rather tat than fiddle with my computer! The high school production of Oklahoma! (directed by my daughter Carol) is this weekend! The rest of the week will be jam packed with meetings after school, dress rehearsals, and performances. I don't need to help with the dress rehearsals, but I do need to have things running smoothly at home (things like having meals prepared) to help relieve some of Carol's stress! So, don't be surprised if you don't hear much from me until next week! I haven't been blogging much lately. I've just been too busy! I've had to make choices... do I blog, or do I tat? Guess what wins? Didn't this turn out great? It's the Daffodil Doily from Learn to Tat by Janette Baker in size 20 Knitty Gritty from Yarnplayer (Marilee Rockley). I love this color combination! I followed my own corrections, and I think the doily turned out beautifully! I may play with the outside edging another time. The doily lies perfectly flat until the last round is tatted. I have some ideas for changing the edging slightly so that the doily doesn't require as much blocking. I've been inspired by Bev and Marty to tat another Iris Niebach doily. Iris's designs are challenging, fun, and beautiful! Right now I'm working on Beatrice... I know... I've already made a few of these. What can I say? I love the pattern! I'm using Lizbeth Spring Green from Handy Hands. My replacement thread arrived Monday. I'm so glad Barbara was able to get the thread manufactured to her specifications. The new batch is fabulous! It has a beautiful sheen, nice hand, is very smooth, and most importantly, it is tats up very nicely. I know I'm only on my first ball, but if all the other colors I have are as nice as this one, I think anyone would be pleased with it.